Several Days ago Microsoft made a first look at Windows 10 App platform. Of course, it’s great to have one developer platform and one core but we still have two months before Build. Therefore, many developers wonder, if they can do something right now to be ready for Windows 10. That’s why I decided to make a series of posts about Universal Applications to help developers start porting their applications right now. In order to do it I am going to describe several topics, which are most important for Universal application development for Windows 8.1 and Windows Phone 8.1. So, let’s start with templates and directives. Since Windows Phone 8.1 announcement developers got a chance to use Windows Runtime for both platforms. It allows to use the same application model, the same set of controls, the same async/await patterns etc. Of course, there was partial support for Windows Runtime since Windows Phone 8.0 but there was no chance to forget Silverlight and use Windows Runtime only. Windows Phone 8.1 brought Windows Runtime to the new level and developers may forget about Silverlight. Therefore, developers got a chance to develop applications for both platforms with minimum amount of work. Of course, you still need to compile your application for Windows Phone and Windows separately and you need to upload two (or more) packages to the Store but, in many cases, you may use the same code and it relates not just to business logic but to interface as well. 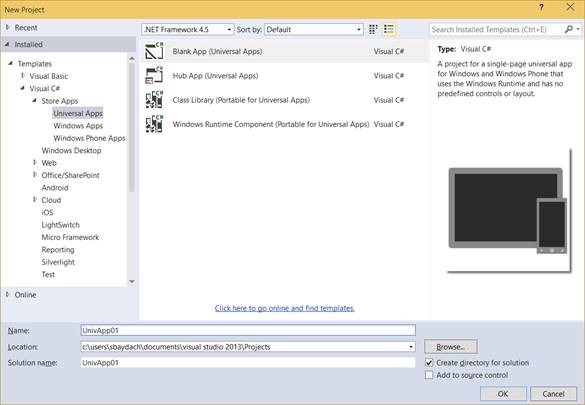 In order to help developers get better experience there, Microsoft introduced Universal Apps template in Visual Studio (Visual Studio 2013 Update 3 and later), which helps to create applications for both platforms at the same time. In fact, when you are creating applications using this template, Visual Studio is creating three projects: Windows Phone project, Windows 8 project and Shared project. The idea is very simple. 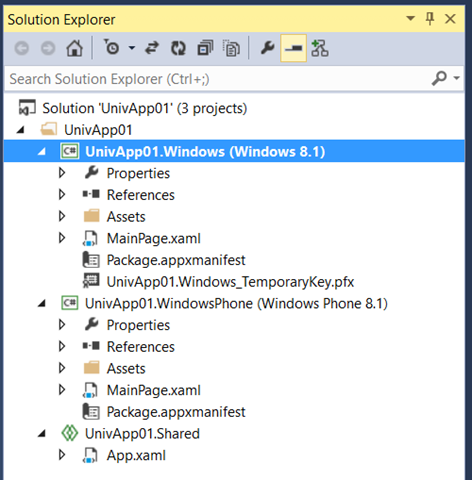 All things that you are adding to the Shared Project will be precompiled to Windows and Windows Phone projects. Therefore you can put there common resources, business logic and XAML pages, if you believe that they are common for both projects. Many developers believe that it’s all that you need to know about existing Universal Apps template and that the best way to make universal applications is creating business logic in a Shared project and different pages for Windows Phone and Windows. But this is not true and this approach will not help you to be ready for Windows 10. If you are going to make real Universal applications you need to know how to build universal pages and page logic as well. So, I will start with directives, which should help you to tune your code for different platforms. Of course, Windows Phone and Windows 8 have some differences. For example, Windows Phone supports just buttons and menu items in applications bar but Windows can present any containers there; Windows Phone contains hardware or software emulated back button but Windows doesn’t and so on. So, from time to time you need to create code snippets just for Windows Phone or Windows. You can do it using #if…#endif directive. It’s possible thanks to WINDOWS_APP and WINDOWS_PHONE_APP constants. Of course you can define your own constants but I recommend to use these ones because it should be clear for many developers and Visual Studio Intellisense mode already supports possibility to switch between two platforms based on these constants. Next time I am going to discuss common XAML pages for both platforms.